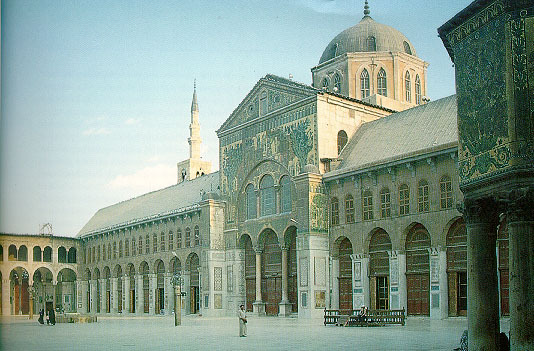 A month after leaving Mount Athos in Greece (May, 2000) I arrived in Damascus, Syria. I left my bag in the hotel and found my way to the Jordan Embassy. I needed a visa to get across the border to Jordan and I arrived five minutes late. The embassy officer was adamant I had to return the next day before 11.00AM. I was frustrated and irritated but I decided rather than give vent to my negativity I’d just walk in any direction to see what happened. I walked streets with only Arabic signs and scripts. My travel guide book gave the street names in English only. I walked by houses with concrete veneers and gardens on terraces, vines entwining telephone polls and wires across a lane making an arch of leaves, palm trees swaying in the dry breeze rooted in concrete pavements, lurid red and blue posters of the latest film shows on billboards and walls. I kept walking sensing the Syrian sun on my face and discovering I had no marker, no point of direction back to my hotel. I was lost in the streets of Damascus. There were flashes of deja vu, definite sensations and feelings I had been there before – a familiarity on the tip of the tongue. Maybe I was here in a previous life. I was lost in a place that felt like a long forgotten home. My stomach rumbled and I saw a restaurant with vats and tables outside on the street. I went in and found a seat at a table with four other men, one much older sat beside me. He began speaking to me in Arabic. When I replied, “Yunan, English” meaning Greek or English he spoke even louder so that others from tables nearby turned their heads towards us. I repeated, “La (no) Arabic – Yunan (Greek), English” pointing to my mouth. The old man had a short white beard that seemed to brighten when he shook his head. The others around our table stared at me. “Then why this?” He pointed to his face and drew a circle around it in the air and then pointed at me. Shrugging his shoulders he extended his arms in front of him. He was in his late thirties, slim with a certain earnestness about him as he walked towards my table. He squeezed between the two men sitting opposite me. By now his presence had made my table invisible again. He said, “You from Australia? I know a little English.” I told him about my trip from Greece via Turkey, to Egypt and that I’d be leaving very soon for Jordan. There was a certain radiance about him, as if there was a tiny grain of the sun burning in his chest. He nodded, “I understand much better in English than I speak.” Something in the way he said “understand” touched me. I wondered why I had to pretend to be Syrian and not speak when we arrived at the saint’s tomb. I figured that it was a very small price to pay – to be silent. We passed some men sitting on wooden boxes playing backgammon on a small table. One of the players smiled at me revealing a toothless mouth. The streets of Damascus are mostly narrow and crooked. Saint Paul lived on Straight Street near where we were. We turned a corner going down a narrow lane and finally arrived at a small door in a stone wall of a mosque. As we entered we climbed down some narrow stairs that lead to a silver cage enclosing a small tomb. It looked like a big beautiful bird cage on the floor. Others already there were prostrating on their knees and lifting their torsos up while silently moving their lips to prayer. My friend indicated that I stay beside him and as he went down on his knees I copied his movements. I bowed and touched the floor near Ibn Arabi’s body. I was amazed that I was there in front of his tomb, a tomb that has been there for hundreds of years. Muhyiddin Ibn Arabi (1165 – 1240) was at the centre of an extraordinary flourishing and cross fertilization of Jewish, Christian and Islamic thought in the Moorish culture of Andalusian Spain. He was a Spanish mystic who had a huge and subtle influence on both East and West. In his early childhood he was recognized and taught by two women saints, Yasmin of Marchena and Fatima of Cordoba. Dante’s “Divine Comedy” was influenced by Ibn Arabi’s work. As I looked through the cage, the more I saw, the less I knew. Who am I? Why am I here? I smelt a delicate fragrance in the swirls of prayer around me. After about a quarter of an hour we arose and left. While climbing the stairs I took one final look at the small tomb of a great man. I felt my own smallness and my own limitations as a “man”. Somehow, even though his body had lay there for so long I felt something emanating from the space that contained Ibn Arabi’s remains. I wondered whether it was his own emanations that remained there or if the people who came to offer their respects and prayers left “soul stuff” that gradually accreted over the years so that one could feel a palpable presence in this small space. Maybe it was both and was it the same in other sacred places? Mahmoud told me that it was Ibn Arabi’s special mission to scatter Sufi seeds onto diverse contemporary fields of learning accepted by the people so that they would come to recognise the One Love behind everything. “Now, let us go to the special place I promised I will show you,” Mahmoud said with a grin. I was curious as to what special place he had in mind. As we walked we mentioned various authors and books to each other and we were amazed that we recognised each other’s references. The theme was the search for truth and the miraculous. 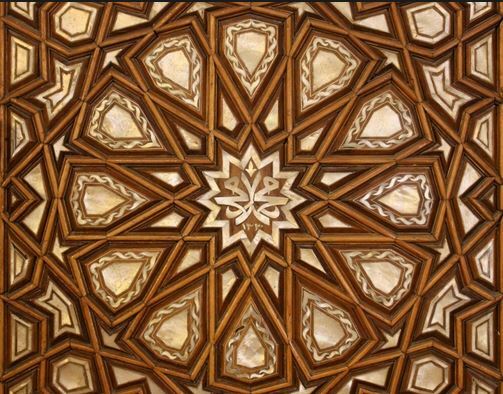 I was excited by the prospect of meeting a Damascus local who may have contact with people who understood the inner essence of Islam and who could sense or know the same essence in Christianity. We walked on beautiful geometric patterned tiles. These patterns were repeated on some of the façade and walls. The doors also had hand carved patterns that looked like they were lifted from crystal reflections. I felt as if I walked into a world of lattices, a net of lines, a web of relationships numerical in kind and geometric in shape. I took my shoes off and entered the main door. Inside was a cavernous space, Mahmoud pointed out a section of the wall with mosaic panels made of coloured and gilded glass. He told me that all the walls were decorated like this centuries ago. The prayer hall had a small domed shrine near where we stood. I paid my respects to St John the Baptist, this time crossing myself the Greek Orthodox way. No one took exception to me for doing so and as we left I felt a real connection between our two faiths. Mahmoud explained to me that Jesus was a prophet and Mary his mother was revered in Islam. He told me that St John the Baptist was revered by Moslems as a saint. Mahmoud was right, this place was a special place and that it would surprise me. He invited me to his home which meant that we had to catch one of the many small service taxis (mini buses) that were everywhere on Damascus roads. Road rules didn’t seem to count here as our bus swerved in and out of lanes with no indication and turned corners without slowing down. While our bodies moved this way and that in concert with the bus I was curious as to how Mahmoud would take my experience at Rumi’s tomb in Konya, Turkey. We jolted forward as the bus swerved around another corner. Mahmoud said, “My friend it is obvious to me that your intentions were pure. You were in pure heart and so whatever you do in such a state is pure. You can do what you will and it would not be wrong because of your state of mind and heart. So, you did the right thing.” He stopped and looked at me eye ball to eye ball. I couldn’t agree more but this didn’t mean that individual and unique differences that make up a particular set of beliefs were obliterated. No, it seems to me that seeking the essential truth behind the formal, literal truths was a way of freeing one self from narrow mindedness and the razor wire of fundamentalism. And I don’t just mean religious. To name a few – scientific, economic, political, psychological, philosophical, artistic ….in fact, name an activity and it can be done and thought of in a fundamentalist way. Mahmoud lived in one of the many concrete and cement apartments in down town Damascus, right under the arc traced by missiles from Israel. He was very lucky he told me because he had a ground floor apartment with some earth for plants. A wooden door from the street set in a large wall was the entrance to his home. He introduced me to his wife and two daughters, his father and mother and his brother as “Stavros from Australia”. His wife Jamil brought some tea in glass tumblers and sat next to me. She said, “Pleased to meet you and welcome. I want to show you a book. I am learning English.” I was touched by the effort she put in saying this to me in English. We were sitting around a wooden table in the enclosed area behind the wall facing the street. Mahmoud pointed to a fountain and pool, the size of a bathtub on our right . He said,”I and my brother made this fountain.” It was made of cement with inlaid patterns of shells, coral and pebbles. The shape was more like a cumulus cloud than rigid lines of concrete blocks. The water spouted from a bowl in the centre while the spirals, circles, squares and triangles of the fountain’s container looked on with mosaic eyes. I walked over to it and admired the detail of their work. Meanwhile Mahmoud’s father, mother and brother brought cucumbers, tomatoes, shallots, radishes, cheese, bread and boiled eggs to the table. Soon after, falafals, humous, fried eggplant, cinnamon beans and dips were added to the table. Everybody sat around the table with the young girls at one corner each. We each had a plate on which we placed what we wanted from the dishes before us. Everybody was interested in this stranger from the other side of the planet – Australia. In my shoulder bag I carried postcards of Australia to give to new friends. I pulled some out and passed them around – pictures of kangaroos, koalas, Sydney Opera House, Uluru and Sydney Harbour Bridge. Everybody recognised the kangaroos. Jamil brought over a book on the English language. She was studying English on her own using this book and some tapes. Her husband Mahmoud helped when he could but he was not fluent in English either. She said,” Please, may I read and you tell me if sounds true? Please?” She read some dialogue between two people. One was asking for directions and the other answered. The only thing missing in her delivery was confidence. As I sat there with this Syrian family I thought about philoxenia, “Friend of the Stranger” the Greek word for “hospitality” which in the original denotes something sacred and more open than “hospitality”. It is mentioned in Homer’s “The Odyssey” where Odysseus experienced philoxenia often in his travels. My new friends expressed philoxenia in such a way that it brought tears to my eyes. I was a stranger in their midst and they offered me friendship, food and comfort. A bond grew between us that had its strength in our common humanity and the fact that everyone is a stranger away from home. Mahmoud and his brother asked me what hotel I was staying at and then phoned for a taxi to take me there. While waiting for the taxi Mahmoud said, “I want you to have this.” In his hand were some worry beads. I showed him the worry beads my uncle gave me in Greece. The Greek ones I had were more solid and heavier with round beads. Mahmoud’s were smaller and the beads were like long brown rice grains. We compared them. Mahmoud and his brother rode with me to my hotel in the taxi. They would not allow me to pay for the fare. They just wanted to make sure that I was taken to the right place. In Damascus, Syria, I found true philoxenia not xenophobia. Now I had a paper boat from the Holy Mountain and a set of worry beads from the Middle East to take with me back to Australia. I put these in a special bag where I kept other special things like hand made amulets, pellets of rose incense, a smooth stone from Dodona, crystals, a small wooden cross from Jerusalem, a tiny rock from Mt Sinai, a stone from an Aboriginal Elder in Australia and some holy oil from a small monastery of nuns near the birthplace of my father in Greece. 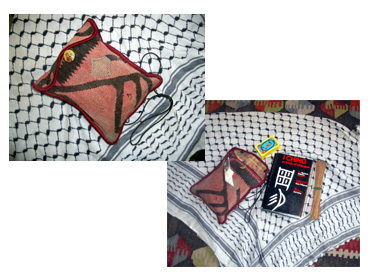 The bag, made of an old Turkish rug remnant was wrapped in a scarf from Bethlehem, along with the Chinese “Book of Changes” – the I Ching and tarot cards. These four items were my psychic technology backup, just knowing they were there helped me. The last item to be put into my special bag was the frayed remainder of the Southern Cross flag that flew on Eureka. It was placed on top of the other things soon after we left South Bellona Reef on our way to Nauru. My Spiritual Kit Bag with psychic technological backups, to be used in case of emergency sailing to Nauru! 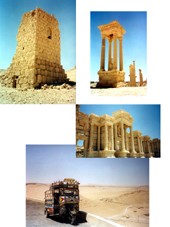 A few days later I visited Palmyra, about 100 miles east of Damascus, near the border of Iraq. Palmyra has the best preserved Roman ruins in the world. The stone buildings all have a rose tint and you feel like you are entering a Roman city with rose tinted sunglasses on. Here’s a picture or two of what I saw. Another time, another story. Palmyra, Syria. That little taxi takes you everywhere. The Gaza Strip is one of the most densely populated places on Earth. A 25-mile-long narrow coastal plain wedged between Israel and Egypt, Gaza is home to 1.5 million Palestinians, over half of them children. Most of its population are refugees or their descendants, driven out of Israel during its founding in 1948. Surrounded by 40-foot high walls of iron and steel, Gaza has only 3 points of entry or exit: the Erez border crossing with Israel, the Rafah crossing with Egypt, and the sea. 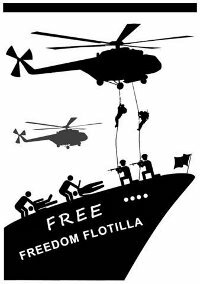 Israel has occupied Gaza since 1967, maintaining complete control over Gaza’s air space and territorial waters, imports and exports, and travel into or out of the territory. Since January 2006, Israel has subjected the Gaza Strip to an increasingly severe blockade, restricting Gaza’s ability to import fuel, spare parts, and other necessary materials. Compared to December 2005, less than 20 percent of the supplies needed for normal trade are allowed into Gaza by Israel, and foreign investment has fallen off by over 95 percent. As a result, the economy has completely collapsed. Most of Gaza’s industrial plants have been forced to close, casing steep increases in unemployment, poverty and childhood malnutrition rates. The siege has led to massive shortages that have rippled through the economy and society. Shortages in fuel have caused gasoline prices to spiral out of control, leading to sustained power cuts. Hospitals, dependent on diesel-powered generators, regularly lose power for several hours a day. Unable to operate irrigation pumps, farmers experience significant loss of crops. Most family homes have running water for less than six hours a day, and almost a third of homes have no running water at all. Sewage treatment centers no longer function properly. Millions of liters of raw sewage have been pumped into heavilypopulated neighborhoods, and tens-of-billions of liters of untreated and only partially treated sewagehave been released into the Mediterranean. Gaza’s fishermen state that the sewage has killed off most of the sea life in the immediate vicinity. In December 2008, Israel broke a ceasefire with Gaza and began a three week campaign of bombings, home invasions, and general destruction. During this massacre, homes, schools, mosques, and UN centers were all attacked by Israel. Thirteen Israelis, including 4 Israeli civilians, lost their lives, while over 1,300 Palestinian men, women, and childrenwere slaughtered. Since the end of the massacre it has become harder than ever to bring in humanitarianrelief, reconstruction aid, or developmental supplies. The siege continues, and the humanitarian condition of the one and a half million human beings illegally incarcerated in Gaza is now at its worst point in the last forty years of Israeli occupation. You are currently browsing the Journeys and Star Gazing blog archives for June, 2010.